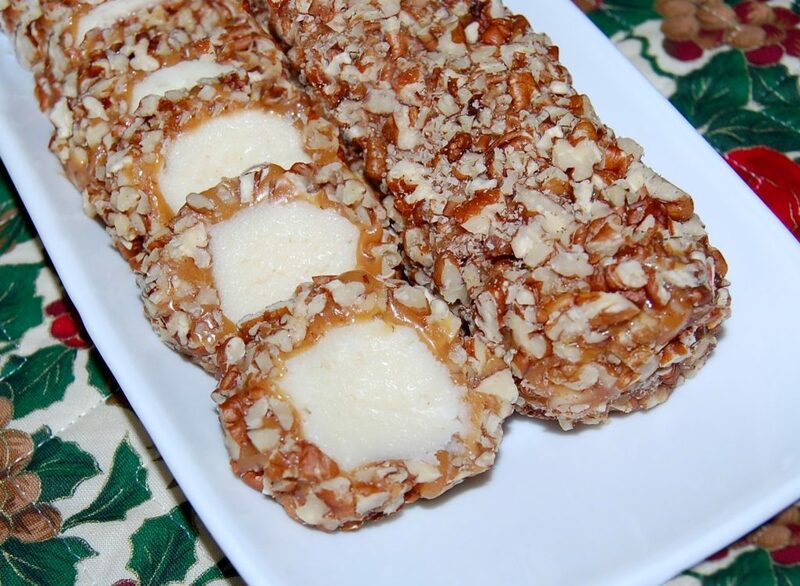 Vanilla fudge formed into a log, dipped in sweet caramel, then hand-rolled in toasted pecans. Butter an 8x8-inch square pan with 2 teaspoons butter and set aside. In a large bowl, combine confectioners' sugar and milk powder and set aside. In a saucepan, combine the 1/2 cup butter, granulated sugar and light corn syrup. Stir until sugar is dissolved and mix comes to a boil. Stir in the confectioners' sugar and powdered milk mixture, a little at a time until blended. Remove from the heat and stir in your vanilla. Continue to stir until the mix starts to mound. Spread into prepared pan and allow to cool enough to handle. Do not allow to cool completely. Just enough so you don't burn your fingers. Using a plastic knife, cut the candy into four long strips and then down the middle. Shape each piece into a log and wrap in waxed paper. Freeze until firm OR overnight if you want to prep this portion beforehand. Melt the caramels with the milk in a double boiler. Place your pecans on a cookie sheet. 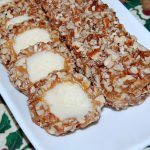 Working quickly, coat your candy with caramel and then roll in pecans.